Hosting web applications in the cloud is a great way to have control over the details of your infrastructure. However, not everyone is a server admin and DevOps also need time for the development side. That’s what cloud management service ServerPilot is here to help you with. 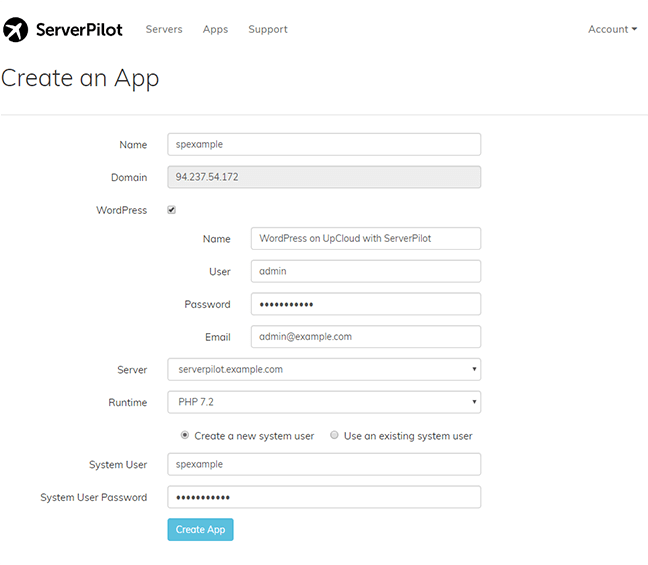 With ServerPilot, you can manage all of your servers and sites through a single control panel. ServerPilot automates your server setup and keeps it secure thanks to automatic updates, firewall control, and security-focused architecture. First things first, if you have not yet registered on UpCloud, begin by getting signed up. Follow the link here to register an account and you’ll receive an extra $10 to get started. Deploying a new server with UpCloud is an easy and straightforward process. 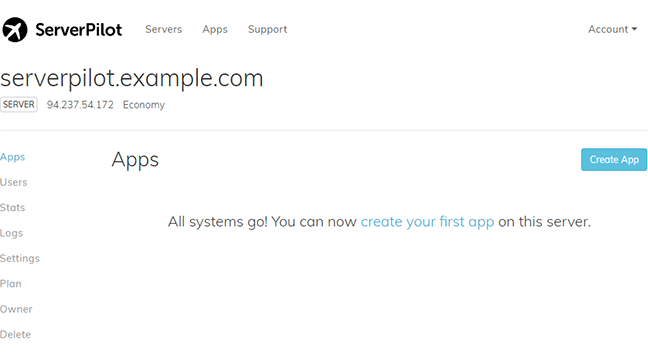 To get started, log into your UpCloud control panel and Deploy a server under the Servers section. The deployment page shows a number of options for customizing a new cloud server. You can find more detailed instructions on server deployment at our newcomer’s tutorials. Next, register with ServerPilot if you haven’t yet. By following their referral link to sign up, you’ll get a free $10 at ServerPilot for managing your servers and hosting your apps! Click the sign-up button on their landing page to start. Then enter your email address and set a password to create an account. Once done, you’ll be greeted by ServerPilot’s easy to use management panel. Connecting a cloud server to your ServerPilot account is quick and simple. All you need to do is pass your server’s SSH connection details to ServerPilot and it will handle the rest. ServerPilot then automates the system installation and configuration by setting up all the necessary software for running your websites. In the ServerPilot control panel, click the Connect Server button at the top right of the page. The Connect a Server view will then open. Enter your server’s IP address and root password. You can find the IP address and the generated root password in the email confirming the server deployment or at your UpCloud control panel under server listing. 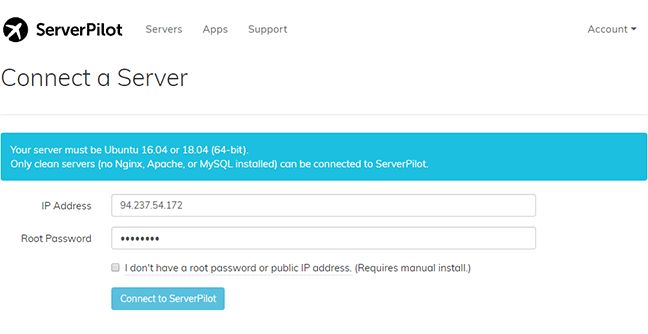 Then click the Connect to ServerPilot button to start the setup process. Once connected, ServerPilot will install the required software onto your server to allow automated application deployment and software updating. Afterwards, you should change your SSH password for the root user. ServerPilot only uses it this one time to connect your server. With the server connected and ready, you are then all set to deploy your first application. ServerPilot makes hosting WordPress, Magento, Laravel, Drupal, and more easy and simple. With just a couple of clicks, you can have a new website up and running. While in the server details, click the Create App button to start a new application. In this example, we’ll create a new WordPress site by selecting the WordPress tic box and adding a name, user, password, and email for the first account. Also, create a new system user and select your server and runtime versions. Finally, launch the WordPress by clicking the Create App button. Once ServerPilot has finished deploying the app, open your server’s IP address in a web browser to test it. You should see the WordPress landing page with the nice placeholder graphics. 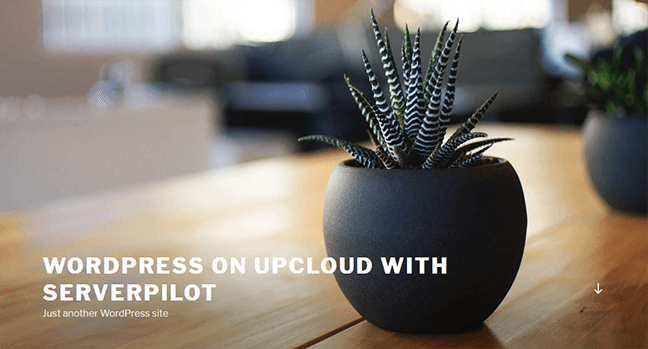 Congratulations on deploying your first site on UpCloud with ServerPilot! You might want to explore their control panel a little to get familiar with the options and features. Besides the automated server setup, ServerPilot offers system and website monitoring as well as real-time statistics on CPU, memory, disk, and bandwidth usage.